Think of your core muscles as the sturdy central link in a chain connecting your upper and lower body. Whether you're hitting a tennis ball or mopping the floor, the necessary motions either originate in your core, or move through it. Everyday acts. Bending to put on shoes or scoop up a package, turning to look behind you, sitting in a chair, or simply standing still — these are just a few of the many mundane actions that rely on your core and that you might not notice until they become difficult or painful. Even basic activities of daily living — bathing or dressing, for example — call on your core. On-the-job tasks. Jobs that involve lifting, twisting, and standing all rely on core muscles. But less obvious tasks — like sitting at your desk for hours — engage your core as well. Phone calls, typing, computer use, and similar work can make back muscles surprisingly stiff and sore, particularly if you're not strong enough to practice good posture and aren't taking sufficient breaks. A healthy back. Low back pain — a debilitating, sometimes excruciating problem affecting four out of five Americans at some point in their lives — may be prevented by exercises that promote well-balanced, resilient core muscles. When back pain strikes, a regimen of core exercises is often prescribed to relieve it, coupled with medications, physical therapy, or other treatments if necessary. Sports and other pleasurable activities. Golfing, tennis or other racquet sports, biking, running, swimming, baseball, volleyball, kayaking, rowing and many other athletic activities are powered by a strong core. Less often mentioned are sexual activities, which call for core power and flexibility, too. Housework, fix-it work, and gardening. Bending, lifting, twisting, carrying, hammering, reaching overhead — even vacuuming, mopping, and dusting are acts that spring from, or pass through, the core. Balance and stability. Your core stabilizes your body, allowing you to move in any direction, even on the bumpiest terrain, or stand in one spot without losing your balance. 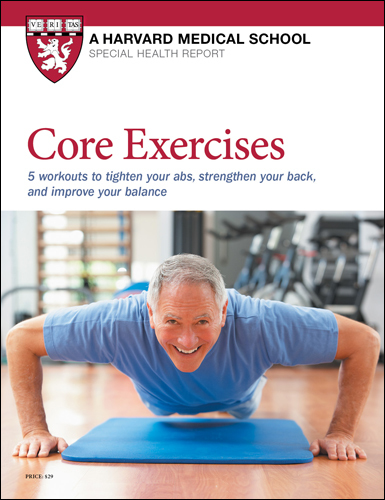 Viewed this way, core exercises can lessen your risk of falling. Good posture. Weak core muscles contribute to slouching. Good posture trims your silhouette and projects confidence. More importantly, it lessens wear and tear on the spine and allows you to breathe deeply. Good posture helps you gain full benefits from the effort you put into exercising, too. Weak, tight, or unbalanced core muscles can undermine you in any of these realms. And while it's important to build a strong core, it's unwise to aim all your efforts at developing rippling abs. Overtraining abdominal muscles while snubbing muscles of the back and hip can set you up for injuries and cut athletic prowess. If washboard abs are your holy grail, it's essential to trim body fat through diet and aerobic exercise and build strong abdominal muscles through frequent core exercise sessions.